I'm going to start a series of blog posts about heroes. Heroes are an essential part of human history. They show up throughout the entirety of literature, all the way back to the first recorded story known to man - the epic tale of Gilgamesh (more than a 1000 years before the Old Testament!). And in real life, heroes are often the difference between survival and death, evolution and stagnation, inspiration and despair. To honour the heroes (both real and fictional) that I admire, here is the first episode of the HEROES series of my blog. 1) This series is much more about painting a picture of the qualities that maketh a hero, not historical recount. 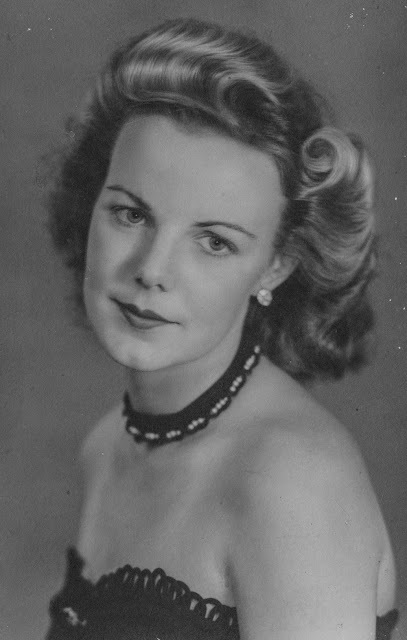 2) I am currently in the process of researching and organising the story of his life in order to begin work on a novel inspired by the experiences of he and my Nanna Marjorie Helen Higgins (nee Stevens). Theirs is an epic tale that has been told many times in my family, in many chapters, in many ways, but it deserves to be made into an epic, romantic, adventurous work of fiction, and I plan to do that (just as soon as my first sci-fi novel is finished!). It is for the latter of those points that this story came to pass. I told my Dad recently (when he was visiting from China) that I was planning this novel. I think he was touched by the notion, given that he too holds his father in the highest esteem as a hero, but also that he himself is a writer, and that for me to follow in his footsteps as it were (at a very similar time in life as when he too "came out" as a writer) is perhaps the highest form of flattery to both him and my grandfather, the latter of whom will be the hero of my story. My Dad had to clean out some personal items he had in storage on the property I live on, and as I was helping him I told him of my plan. When I saw him again a few days later, my comment to him about the book I was planning had obviously stayed with him, because he decided to gift me a collection of treasures that had belonged to his father. Needless to say (as you may empathise when you see the treasures below) that I was utterly moved and inspired by this collection, and no sooner had I spent a little time studying the contents, did the direction and outline of my story based on Aubrey's life take shape - INSPIRATION! 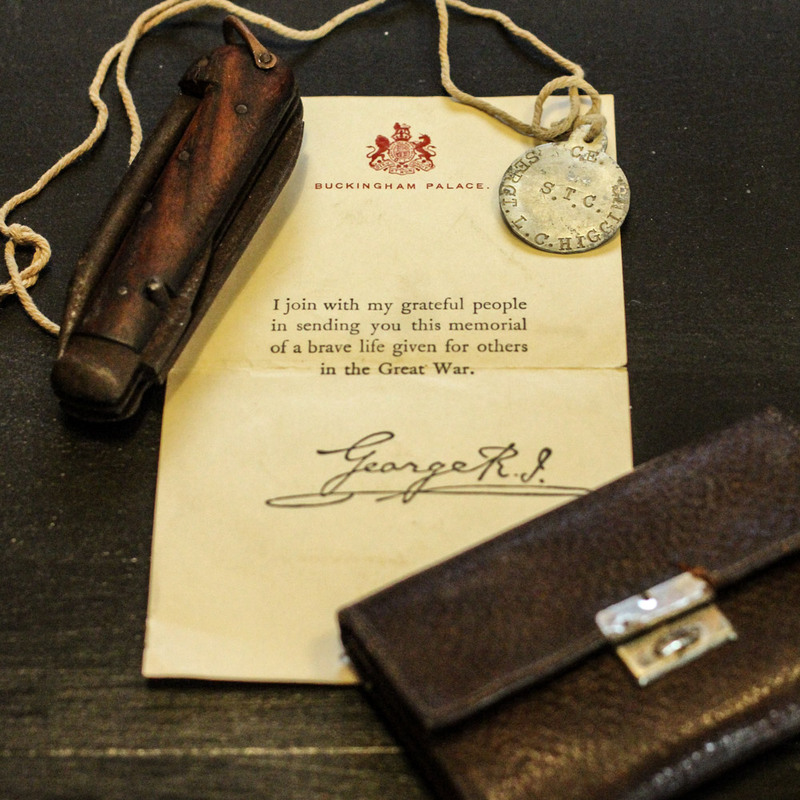 So these objects now take pride of place in my writing/music studio/man-cave, and each object will offer you a mere morsel of the heroic life that was Aubrey Charles Roff Higgins's. Here is the shelf on which Aubrey's items live. Some of them I already had, some were the recent gifts from my father. The Stetson hat to the right was one that my grandfather wore a lot, and it's pretty old. One peculiar thing about it is its size. My grandfather sported a very small head - at least insofar as its diameter. He was tall, and his head was more long than wide. No one else in the family could wear this Stetson hat successfully, except my son at age 2, which quickly changed again when he had a growth spurt at age 3. My grandfather was born into a military family, going way back. His father Louis Charles Higgins was a soldier in the British Army based in India. He was fatally wounded in Mesopotamia when my grandfather was just a boy, during World War I (then known as the Great War). There is only one (maybe two) photos in existence of that father and son together. I have them both, somewhere in the boxes of artefacts from my grandparents' lives - marked TO BE SORTED. I will post the photo on this here bog when I find it. In the above photograph is an official letter (brief as it may be) from King George VI, embossed with the emblem of Buckingham Palace, that came with the large brass medal which was minted in honour of Louis Charles Higgins upon his death in the line of duty. These items were the earliest remnants of memory my grandfather held of his father. With the letter from the King is the leather wallet that Louis wore on his person when he was shot, along with his folding army knife, and his dog tag. The tag is scratched by the sand of the desert in which he fell. The wallet still contains grains of it. 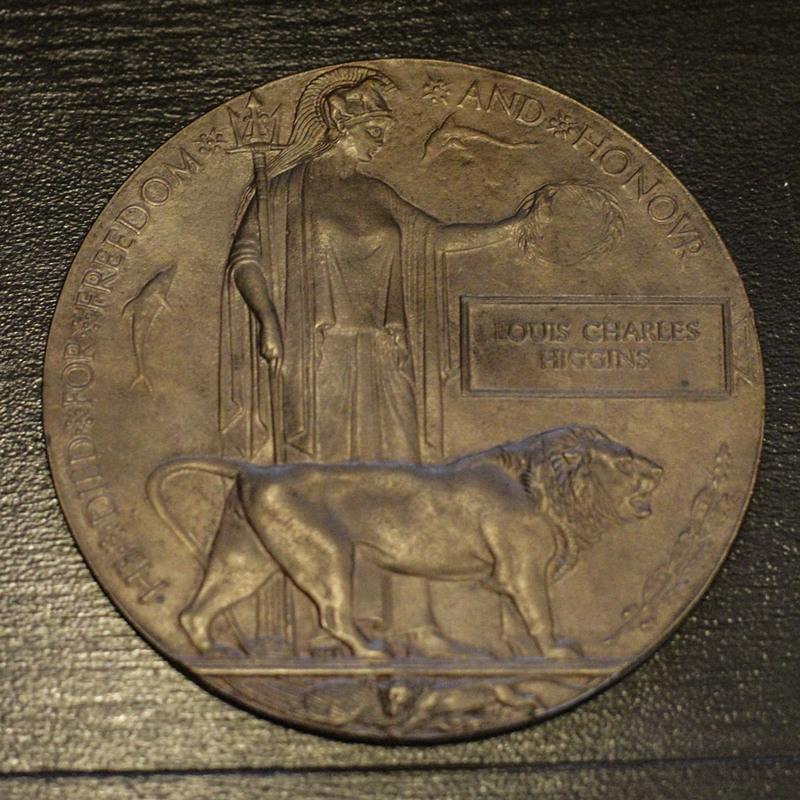 Here is the aforementioned medal that was sent to my Great Grandmother, and kept by my grandfather until his dying day. 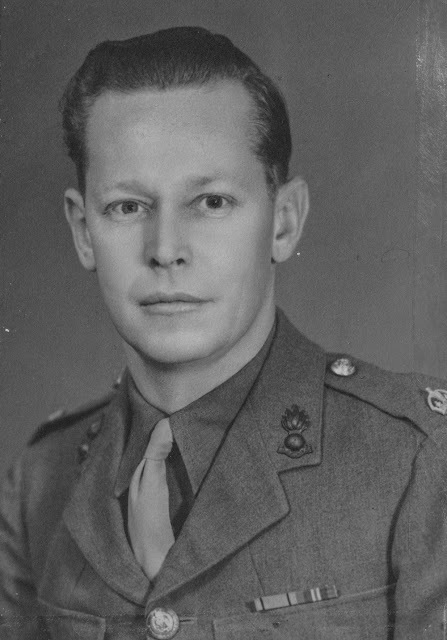 The tales and culture surrounding my Great Grandfather and his service to King and Country must have had an impact on my Grandfather, because when he was only 13 years old, he shipped off from India - the country in which he was born and raised - to England, to undertake military boarding school and work towards become a young officer in the Royal Army. 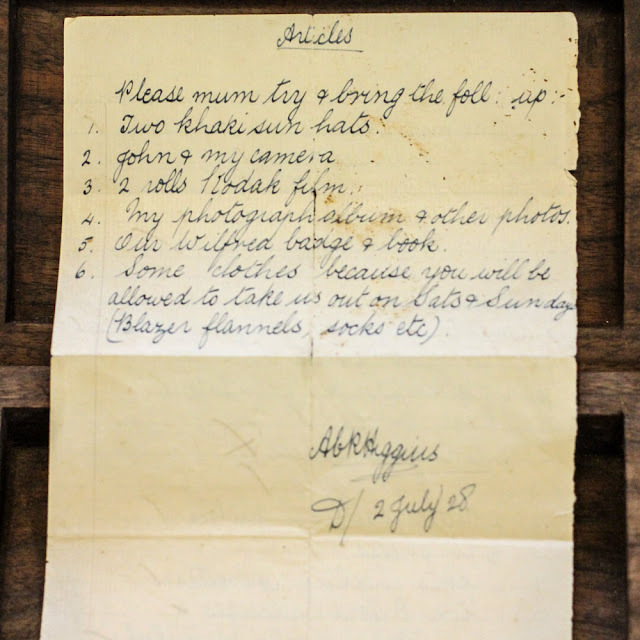 In 1928, at age 14, Aubrey wrote this two-sided note to his mother with a list of items he wanted her to bring when she was visiting him on a break from his military boarding school. The penmanship is - at least to me - breathtaking. Certainly better than anything I was capable of at age 14. Such was the ways of many British men in the early 20th Century, especially those of military discipline. In 1932, at age 17 (almost 18), Aubrey graduated from his military school "as a 'Sapper'", as the good Captain of "B" Company from the Army Technical School for Boys wrote to Aubrey's mother. That meant that he was a Royal Engineer, beginning his career in England, and eventually finding his way back to India, from whence he came. 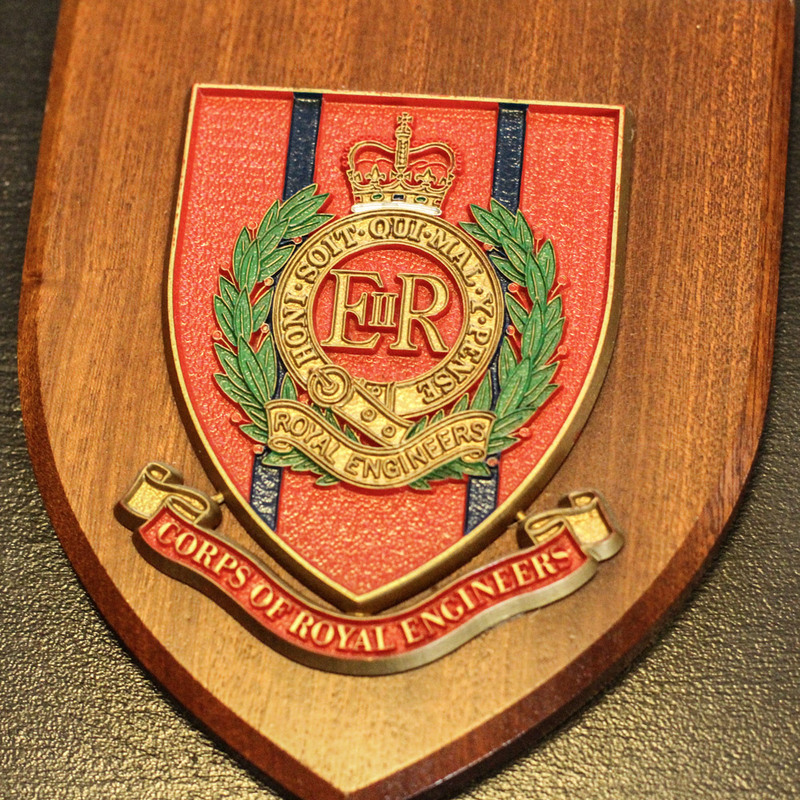 Granddad was very proud of his career as a Sapper, and he always kept this coat of arms on his wall, in every house he lived in. This emblem has always been a symbol of my grandfather and his character, as a man of integrity, a gentleman, and educated man, a conservative, a builder, an engineer, a warrior, a protector of innocence, and all the other things that he was to me. In his work in the Corps of Royal Engineers, he built bridges, repaired vehicles, built boats, and eventually as he became a commanding officer, led platoons of Indian soldiers. He also spent a time overseeing a platoon of Japanese soldiers in Java after their surrender at the end of WWII. His main job was to prevent them from committing seppuku (honourable suicide). To do this, he had them convert decommissioned weaponry into speed boats, and had them race each other around the lake. Purposeful work kept those men alive. 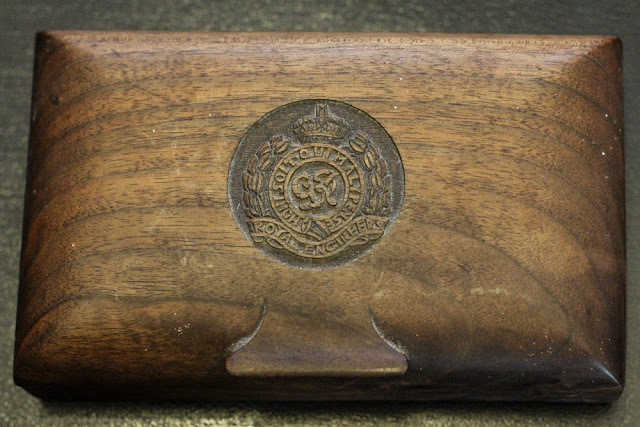 His Royal Engineers wooden box - in which he kept letters from the King, his medals, and love letters to and from his wife Marjorie - my Nanna. On the 7th of February 1941, at age 27, my grandfather married Marjorie Helen Stevens on her 18th birthday. They remained married until his death 66 years later. On the morning of their wedding, he wrote her this love letter (above). She evidently kept it on her person as it is torn and folded into disrepair. 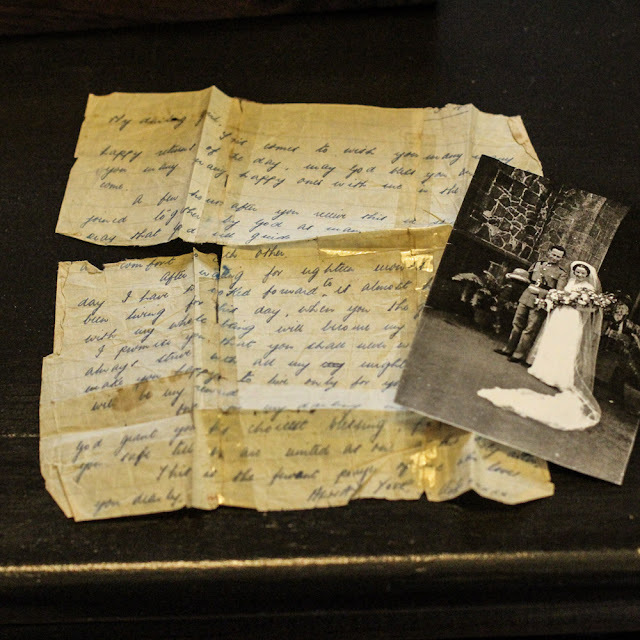 But this treasure was kept nonetheless, and it is just a taste of the depth of Aubrey's love, commitment, and honour that he brought to their relationship, and the seriousness in which he took his oath of marriage. This comes to wish you many many happy returns of the day. May God bless you and grant you many more happy ones with me in the years to come. A few hours after you receive this, we shall be joined together by God as man and wife, and I pray that God will guide and help us to be a blessing and comfort to each other. After waiting for eighteen months, at last the day I have so looked forward to is almost here. I have been living for this day, when you, the girl I love with my whole being will become my life long partner. I promise you that you shall never want. That I will strive with all my might and main to make you happy, to live only for you. Your happiness will be my reward. Once more my darling "Many happy returns", God grant you his choicest blessing, protect and keep you, keep you safe, until we are united as one at His Holy Altar. This is the fervent prayer of one who loves you dearly. Aubrey was an accomplished swimmer, expert diver, and an active member of the Royal Life Saving Society. Above are two medals he was awarded, one for actually saving the life of a drowning man. 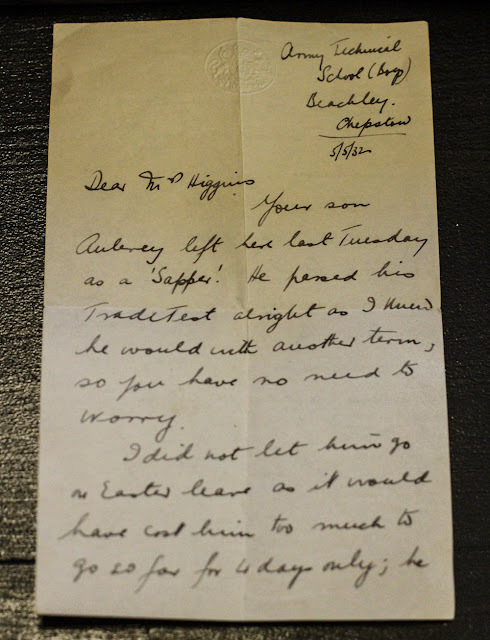 That alone should serve as evidence for why I regard Aubrey Charles Roff Higgins as a hero, but in truth it is only the surface of his heroism. The rest, I shall explore in great depth, in my future novel. By the end of his long military career, in which he ascended the ranks to Major, Aubrey was a decorated soldier. 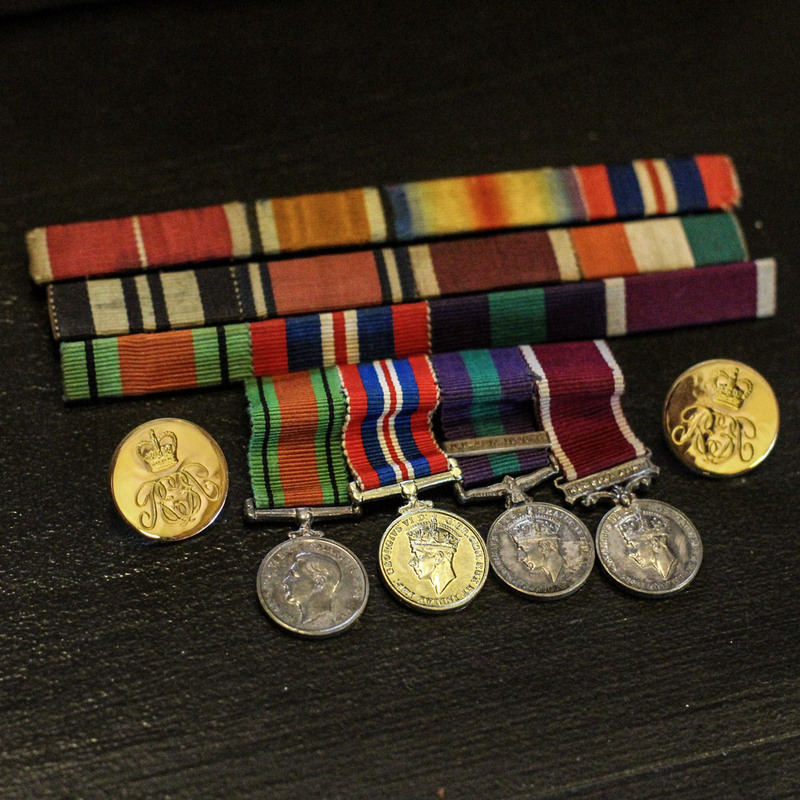 I don't actually know what each of these medals represents - that shall be part of my research for the novel. The gold discs were his uniform cufflinks. 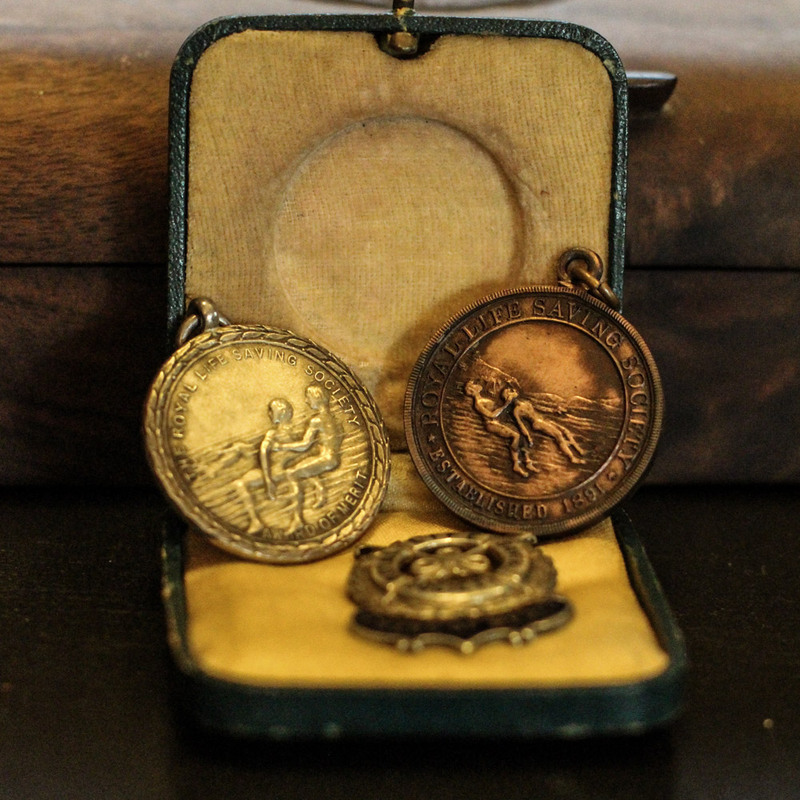 The medals are miniatures that came with the full-sized medals. The big ones were sent to his eldest son, my uncle John in England, who also served a long and decorated career as a soldier in the Royal Army. When Granddad died, it was fitting that his Army son should have them. But the miniatures stayed with my father, and now I am honoured to be their custodian, along with all of the other treasures that I have shared here. About a year ago, Aubrey's widow Marjorie died peacefully in my presence. I had the great privilege of growing up with this great Matriarch and her late husband, the great Patriarch of our house, as central members of my family life. I spent lots and lots of time with them. Many people cite a key moment in modern history that everyone (except millenials) can remember as the question: "Where were you when the planes hit the towers?". Well, I (at age 15) was in the home of Aubrey and Marjorie Higgins, my beloved grandparents, where I stayed one night every week without fail for my whole high school career. Prior to that, they lived with my parents, sister and I in an adjoined granny-flat to the house in which I grew up. Today, the ashes of both Aubrey and Marjorie are combined together, and became the food for a mango tree, which we planted in their honour (as two children of the last years of the British Raj) only a few metres away from my man cave, where I sit and write this now. It is my hope that one day my sons, or perhaps my grandchildren, will climb and play in that tree and I will tell them of their ancestors. It will be my great honour and privilege to tell a fictionalised version of their great, romantic tale, just as it is an honour to possess these treasures that belonged to my Grandfather, and to publish a little about him here, as the first of my Great Heroes. Finally, I will leave with you a song of them. From my latest album, released only a few days ago, this song is calle "Marjorie (My Love Will Remain)" - it a song I wrote imagining what my grandfather might have liked to have said to my Nanna as he lay in his nursing home bed at age 93, unable to speak, dying. It is his swan-song to her, to tell her go on, to live through the pain and the loneliness, to know that there is a life to enjoy without him, and that even if he can no longer be with her, his love will always remain within her.